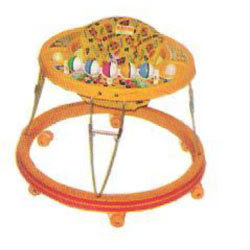 When the kid could stand on her own without any support and was attempting to walk, that is around her birthday, I gave her a walker which kind of looked like this, had 6 wheels, had a foot rest, sun shade, handling stand. It is a bit expensive, we can invest on it if we start the kid early on on the walker, like when she/he is just sitting without support. Like in various other posts, I was a no walker until the baby stands up mom... The doctor has specifically mentioned not using the walkers until the baby does it on her own or stands up on her own at least. To my horror, a few of my cousins put the kid in the walker as and when she/he could sit up or make an attempt to sit as early as 6th or 7th month onwards. Those kids walked real fast and met that milestone pretty fast, but still what doctor said lingered on in my mind. I used to wonder when those moms compared milestones with my kid if I was depriving my kid of something by not providing an aid to walk... well, it is a personal choice to go for one or not. Sreya walked on her own only in her 13th month after her birthday. She was able to stand and walk around the bed a little with the help of a the bed edge but nothing much.. As soon as I put her in a walker, within a week she was walking really well, halting a little but walking steadily. I had gotten her a rocker/walker/swing combo by Amardeep when she was 9 months old but since it had just 4 wheels and the kid tended to walk side ways rather than to the front, she had a couple of real bad falls even when we were close behind watching her, so my personal experience, for kids who have learnt walking and who are yet to learn, it is a bad choice of a walker.. DO NOT USE THIS AS A WALKER. Rocker/stroller if you have a handling rod attached to it is fine.. but as a walker, strict NO. This one is a traditional yet good model which I got so that she can walk around on her own and since she was an on-the-go baby with most people carrying her all the while in the village, I had to have 2 spares, one to take wherever she goes and one to keep at home, this one was for us to carry around where she goes like a temple, any neighbors place, etc. Above everything I would say round walker helped me a lot, relatively less expensive considering the very short span of time it had been used by me.. The one in the picture is a sit to stand walker.. once the kid is walking on her own without falling, this would be of good use because with my kid, she used to bend forward a lot to play with the games rather than use it as an aid to walk... the toys in front provided distraction from walking, so I got the one in the toy section pictures with less games... It is according to me, not a very good buy for Indian kids or rather kids in India since it is very light, the kid would fall unless he/she understands grip. I loved my traditional 3-wheeled walker, wooden one the best of all because that provided a good grip to stand on with the heavy wooden bottom.. will put up the pic when I get it from the neighbor I handed it over to..
Whatever be the walker, the ground rule is stay close, really really close and keep a watchful eye when you let others handle this for you.